- Knob Option: Orbit (ORB). - Delivery: All Satin Chrome (626) Schlage A-series Knobs are In Stock. Please allow 3-5 days' lead time on all Brass (605) and Oil Rubbed Bronze (613) finishes. Function: The Schlage A-Series Knobs are available in Passage (A10S), Privacy (A40S), Keyed Entry (A53D), Classroom (A70D), Storeroom (A80D), and Single Dummy (A170) function. Finish: The Schlage A-Series Knobs come in Brass (605), Oil Rubbed Bronze (613), and Satin Chrome (626) finish. 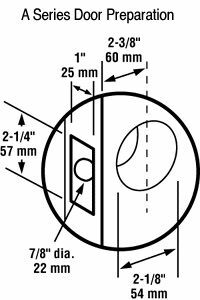 Knob Design: The Schlage A-Series Knobs come in Orbit (ORB) design. Cylinder Options: All Entrance (A53LD), Classroom (A70LD), and Storeroom (A80LD) functions are sold Less Cylinder; see "Companion Items" above for all Cylinder & Keying options. Special Order Information: For pricing on any function or finish of the Schlage Commerical A-Series Knobs not found on this page please contact Taylor Security direct via e-mail (sales@taylorsecurity.com) or call us toll-free at 1-800-676-7670. - Passage (Hall & Closet): Both knobs always unlocked. - Privacy (Bedroom & Bathroom): Pushbutton Locking. Can be opened from outside with small circular tool. Turning inside knob releases button. - Keyed Entry (Entrance): Unlocked by key from outside when outer knob is locked by turn-button in inside knob. - Classroom (Classroom Lock): Inside knob is always active. Key releases outside knob. - Storeroom (Storeroom Lock): Outside knob fixed. Entrance by key only. Inside knob always unlocked. Special Order Information: For pricing on any function or finish of the Schlage Commercial A-Series Knobs not found on this page please contact Taylor Security direct via e-mail (sales@taylorsecurity.com) or call us toll-free at 1-800-676-7670.